In line with the updates to the My Resources Module, each Event Form (e.g. 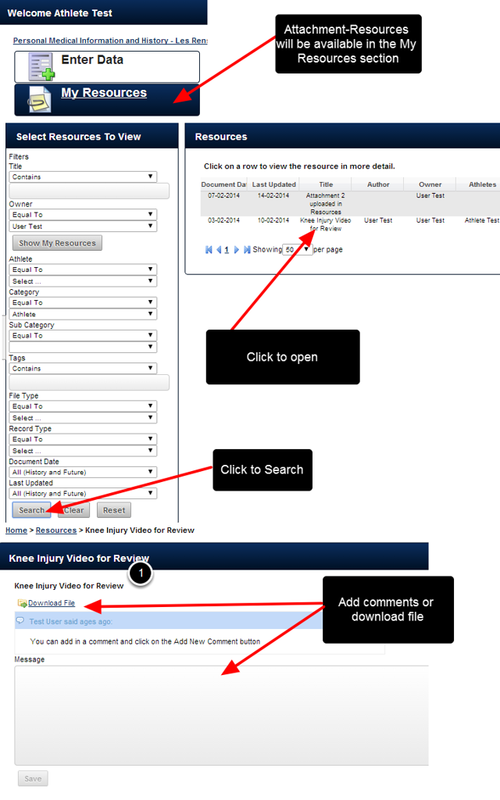 a Player Review, Video review form, Tour Programme) can have an attachments (Attachments uploaded to an Event Form, NOT a File that is uploaded within the document) so that it is available in the special Attachments section in the Sidebar and the Athlete History. These Attachments can also be set up to act as a "Resource" so that they appear in the My Resources Module. 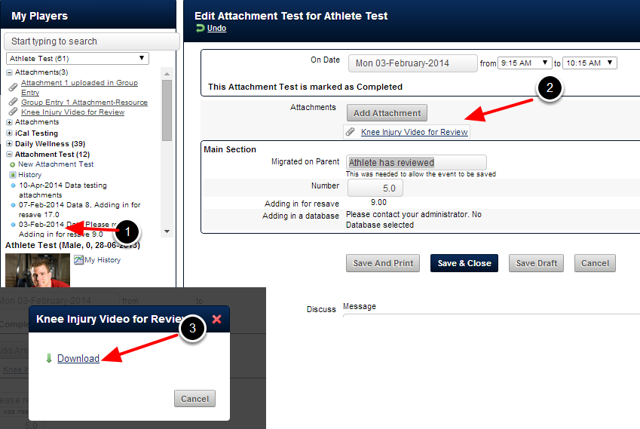 This change will enhance your ability to upload, access and share attachments that a group of athletes need access to. 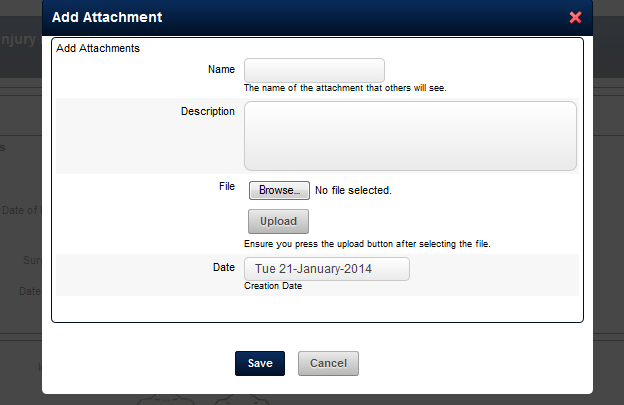 These Attachments and Attachment-Resources can now be attached during Group Entry (enter data for group). N.B. Your ability to access specific Resources and Attachments for different Event Forms is set by your system Administrator. If you do not have access to the correct information or Resource Categories, please contact your organisation's Site Administrator immediately. Previously, Attachments could only be attached to a single athletes' entry. Now, a single document or file can be attached during group entry mode, and this single file appears with the individual entries, either on the coach or the athlete's view (providing they have permission to access it). Enter in the required data for the athletes. 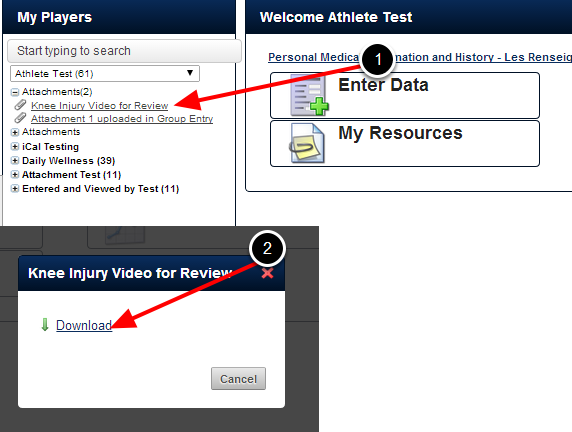 You may want to complete the data in the table, or leave it blank for the athlete to enter when they re-open the form. Now at the top of the Event Form, you can see that there is a field called Attachments where you can add in one or more attachments. To add an attachment, click on "Add Attachment". 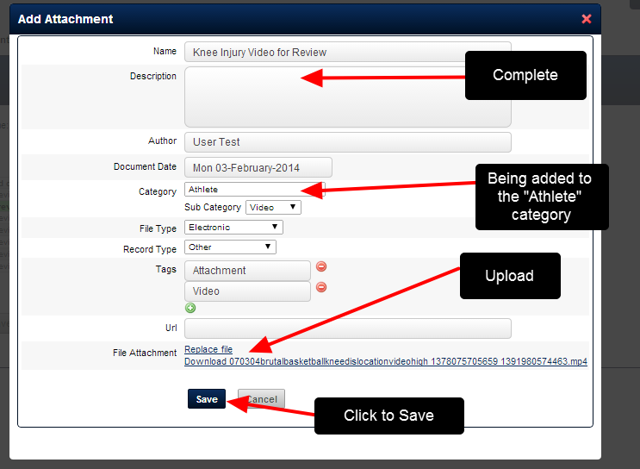 The example in the image here shows the attachment is being uploaded and it is being added into the "Athlete" category. It is being added into that Category because all athletes in this system have been given access to that Category. This means, if the athlete is given access to access this event form, and this category they will each be able to access the data entered for them and the attachment entered for the group. All of the Event Forms on your system need to be set up specifically to have Attachments, and then Attachments that act as a Resource. The image here shows that this Attachment is only set as an Attachment, NOT as an Attachment Resource. If the attachment is set up this way, the attachment will still appear for each athlete attached to the entry and in the Sidebar for all of the athletes, but it will not appear in the My Resource Module. Alternatively, the entry can be opened for any of the individual athletes, and the attachment appears as well. 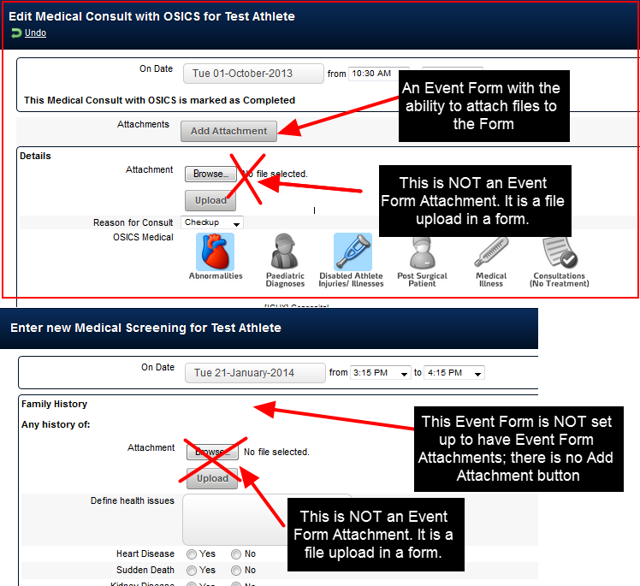 Zoom: Alternatively, the entry can be opened for any of the individual athletes, and the attachment appears as well. Any Attachments and Attachment Resources will appear in the Attachments List in the Sidebar. The attachment can be downloaded from here, or by opening the Event Form, or from the My Resources Module (if the attachment is set up as an Attachment-Resource, and the athlete has access to the My Resources Module). 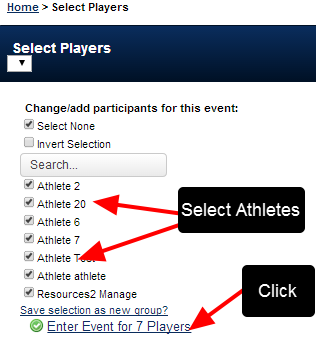 To be able to access the Attachment-Resource, the Athlete MUST have read access to the Event Form, AND Access to the Category that the Attachment Resource is stored in (e.g.in the example in the steps above the Resource was added to the Category called "Athlete"). The Category was enabled on the Role permissions for the athlete.